In my last article shown you How to install LAMP stack with easy steps. 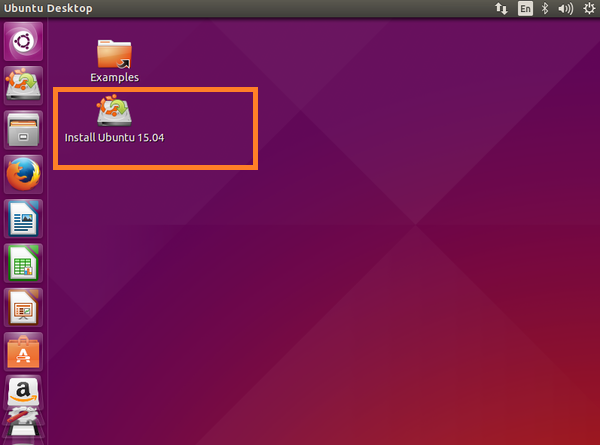 Today I would like to write about “How to install Ubuntu 15.04 along with Windows 8”. Recently I was trying to make my system dual boot (Ubuntu 15.04 alongside Windows 8), I have faced couple of issue before I am successful. It is not anymore that easy to install Ubuntu 14.10/ 15.04 alongside Windows 8, earlier we were able to install directly using WUBI installer. I thought I can post steps here, so that it will also help others. If you have Windows 8 pre-installed, you may find difficult to install Ubuntu or any other OS alongside. Microsoft has introduced several new features which made a mess for Linux based operating system. Windows 8 introduced UEFI and secure booting which is preventing any other operating system to install. UEFI is basically similar as BIOS booting. You should know that until UEFI mode and secure booting is enabled you cannot directly boot/use Ubuntu. 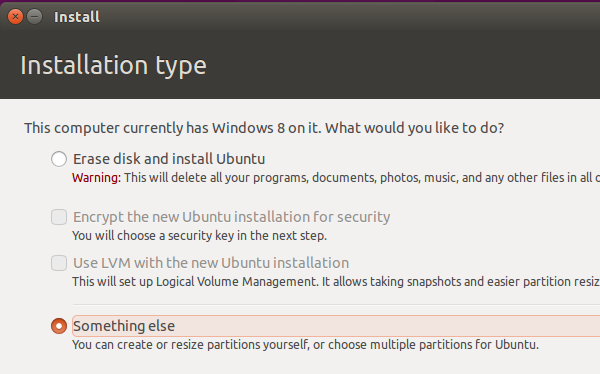 Installing Ubuntu inside Windows using WUBI is not supported in Windows 8. Here I am posting some steps as I followed towards successful Ubuntu installation alongside Windows 8. Download Ubuntu from the website. Make sure you are downloading 64 bit, 32 bit may not work. In my case I have downloaded 64 bit version. Make sure you have space least 10 GB in separate drive. In my case I have created a drive with 100GB for Ubuntu installation. Burn the Ubuntu into Live CD, DVD or USB in windows. I have used USB drive to boot Ubuntu. Download USB installer and install it. Browse downloaded Ubuntu ISO as below screenshot below. 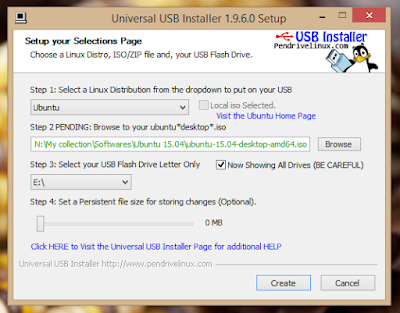 Choose USB drive and click create to install Ubuntu into your USB drive. This technique introduced in Windows 8 to reduce booting time. When we shut down our Windows 8 system, it use hibernate concept to write some system data from RAM to disk. Doing this when next time windows boot it restore the data faster. By this way Windows 8 manage to boot in 10 seconds on SSD. This is creating a problem for Ubuntu or any other operating system installation process. So it’s important to disable Fast Startup in Windows 8 / 8.1 before installing Ubuntu. Go to Power option and click on the “Choose What Power buttons do” link from left menu. You will be landed on screenshot below. 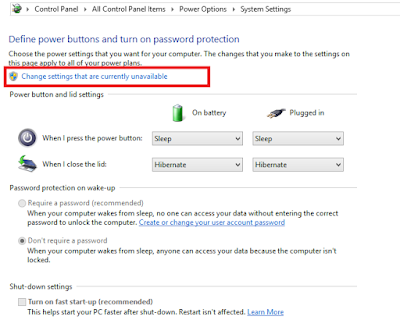 Click on the highlighted link “Change settings that are currently unavailable” to change settings and uncheck “Turn on fast startup” screenshot below. That’s it well good to go for installation process. Next important thing is to disable secure boot. You can go to boot manager from BIOS (By Pressing ESC/Delete or F1-F12 keys) setup when system starts, In my case I pressed ESC to go to “BIOS settings” from there “boot manager” in that section you also will find “Secure Boot” make sure it is disabled. Windows 8 has UEFI design which is replacement of BIOS. Save changes and we are ready to install Ubuntu now. 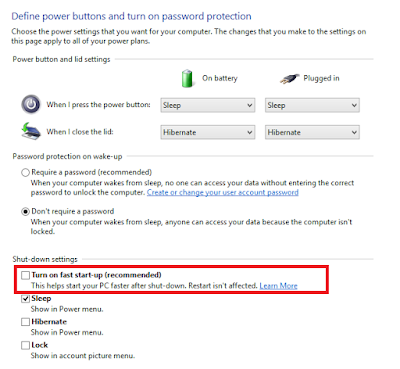 Plug in USB drive into your system and restart. When you restart system you will find screen to “Try Ubuntu” and “Install Ubuntu”. Click on “Try Ubuntu” as this helps to check your hardware compatibility. You will login into Ubuntu and see screen below. 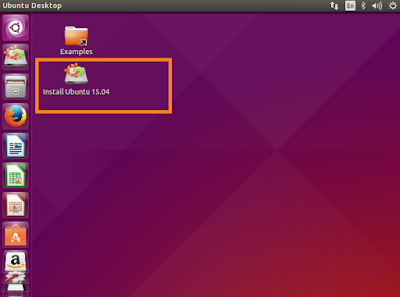 Click “Install Ubuntu 15.04” highlighted above. This is lead you to installation process. On the “Installation type” screen you need to select “Something else” as we are going to make “Duel Boot” with Windows, screenshot below. Select appropriate drive to install. Before pressing next button remember to format drive using “change” button and it should be “Ext4” file system. Mounting point should be “/” as it will install Ubuntu into that primary drive. Screenshot below. That’s all we are done with main job, now you need to do regional, language, account settings etc. for successful installation. Wait till process completes and it will ask to restart, do restart. Remove USB and after system restart, you will see screen below where you need to select Ubuntu to boot. Some time you may not see the above screen and Ubuntu may directly boot. I was facing the same issue. 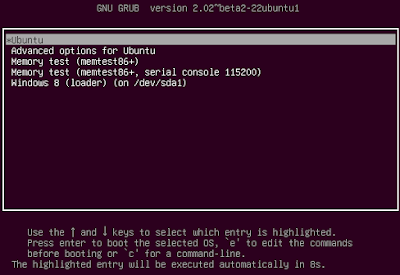 If you don't see screen prompting you to choose which Operating system to use “Windows 8” or “Ubuntu” you need to execute below command from Ubuntu Terminal to enable GRUB window on startup. Above command will repair boot screen issue. Restart the system. 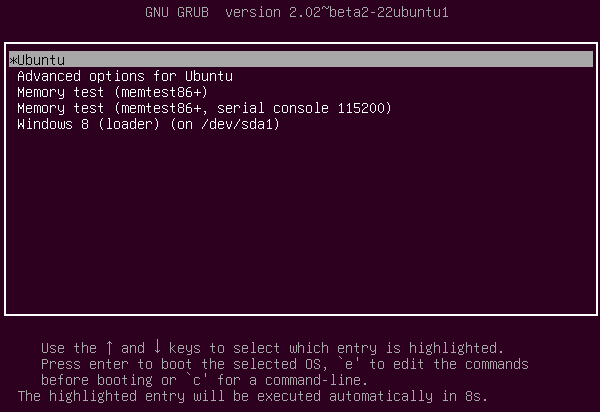 You will be able to see screen where you can choose “Windows” or “Ubuntu” to boot. That's all we are done. Enjoy the Linux flavor alongside Windows. Setting up Ubuntu 15.04 alongside Windows 8 for open source development is little challenging but following above steps you can easily achieve it. I faced couple of issue before successfully installation. Don’t wonder if Ubuntu installed drive is missing in Windows 8 “This PC”, it won’t display since the drive is “ext4” formatted for Ubuntu installation. I hope this tutorial will help you. If useful please share, leave comments below. I will continue writing and try to bring some tutorial of real time challenges. Stay Tuned! Have a nice day.